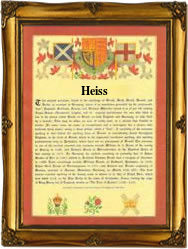 This is a rare German/Austrian surname form of the more usual Hiess or Heiss. However spelt, the origination is the same, being an aphetic form of Mathies, itself a derivative of the personal name Matthew. The origin is biblical, from "Matityahu", meaning "Gift of God", and is first recorded in the Greek New Testament in the form "Matthaias". The popularity of the name was such that over three hundred and fifty variant forms, ranging from the Polish "Matys", to the English "Matten", and the Swedish "Madsen, have been recorded. Recordings from German Church Registers give the following examples: Andreas Hiess, who married Maria Himmelbauer at Markersdorf an der Pielach, Niederoesterreich, on January 28th 1691; Mathias Heiss, who was christened at Haugsdorf, on February 5th 1751; and Anne Maria Hiesz, who married Thomas Katzenbeizer on January 1st 1777, at Heidenreichenstein, Niederoesterreich, in the reign of Joseph 11 of the Holy Roman (German) Empire, 1765 - 1790. The first recorded spelling of the family name is shown to be that of Johannes Heyse, which was dated 1297, in the "City Rolls of Rostock", Germany, during the reign of Adolph 1, Holy Roman (German) Emperor, 1292 - 1298. Surnames became necessary when governments introduced personal taxation. In England this was known as Poll Tax. Throughout the centuries, surnames in every country have continued to "develop" often leading to astonishing variants of the original spelling.